A POET TRIES TO CREATE A HOME WHERE MUSES WOULD CHOOSE TO DWELL. 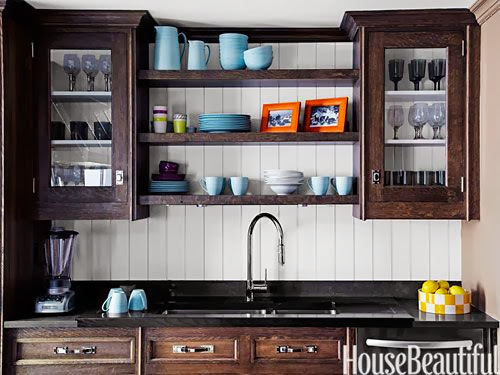 Have you seen House Beautiful's Kitchen of the Year in the October issue? Is something shifting away from the oh-so-boring white kitchens? – because this is the first one I have liked in a long time. Sure, I like the painted green kitchens, but the other non-white ones tend to be very dark wood and modern looking. Where are the cozy kitchens? Well, here is one. 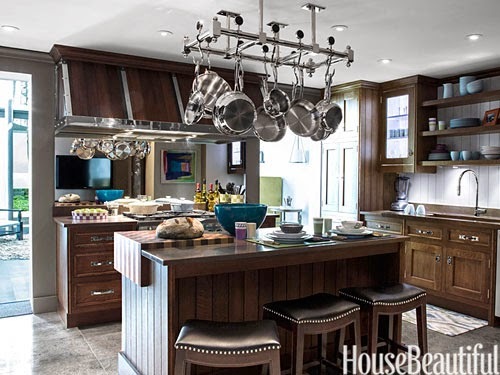 House Beautiful 2013 Kitchen of the Year in Kips Bay Show House. I think one reason I like it so much is is reminds me of what my kitchen is like, or could be like, someday, though my cabinets are prefab knotty alder, not quarter sawn oak. (You may remember my last post about choosing a paint colour for my kitchen.) I haven't posted the after pictures yet, because we are still waiting for our new cabinet crown moulding, which is stalled in the colour match department. My kitchen doesn't actually have a window in it either, except at the end of the eating area, and it opens into the light-filled family room. Still, it also has a low ceiling with lots of pot lights. The low ceiling might help it to feel cozy, too. I like how a few cabinets in this kitchen have glass doors, and there are some shelves, to break up the look of the upper cabinets. But overall, I like the cozy look of the wooden cabinets themselves. To me, this kitchen looks like home. Wallpaper in an Open Concept House? Why do Little Things Make me Happy?